Security tapes of the Oklahoma City bombing just released had key sections erased. Salt Lake City attorney Jesse Trentadue obtained the security camera tapes of the bombing through the Freedom of Information Act. After many years of secrecy around these critical tapes, the missing portions only fuel conspiracy fires. 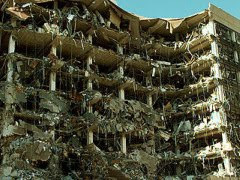 Shortly after 9 AM on April 19, 1995, bombs in Oklahoma City's Alfred P. Murrah Federal Building killed 168 people and injured hundreds more, rocking the entire nation and world. Initially blamed on Muslim terrorists, the official investigation eventually led to the conviction of Timothy McVeigh, who was executed in 2001, and co-conspirator Terry Nichols, who is serving life in prison. "The real story is what's missing," said Jesse Trentadue, a Salt Lake City attorney who obtained the recordings. "Four cameras in four different locations going blank at basically the same time on the morning of April 19, 1995. There ain't no such thing as a coincidence," Trentadue said. "The interesting thing is they spring back on after 9:02," he said. "The absence of footage from these crucial time intervals is evidence that there is something there that the FBI doesn't want anybody to see." The FBI in the past refused to release the security camera recordings, leading Trentadue and others to contend the government was hiding evidence that others were involved in the attack. "It's taken a lawsuit and years to get the tapes," Trentadue said. Trentadue's brother Kenneth died in the Oklahoma City bombing, possibly murdered by officials who mistook him for the bomber. As stated in the AP article, "A judge in 2001 awarded Kenneth Trentadue's family $1.1 million for extreme emotional distress in the government's handling of his death." This lead the deceased's brother Jesse to search deeper into the bombing, where he came up with lots more evidence that did not match the official story. The tapes are but a chapter in this intriguing saga. The official story of the bombing has been challenged by other key individuals and groups. A 2006 AP article states: "A two-year congressional inquiry into the Oklahoma City bombing concludes that the FBI didn't fully investigate whether other suspects may have helped Timothy McVeigh and Terry Nichols with the deadly 1995 attack, allowing questions to linger a decade later." And according to a 2007 BBC News article, "The FBI man in charge of collecting evidence from the government building destroyed by the Oklahoma bomb has called for the case to be reopened. Former deputy assistant director Danny Coulson ... said a federal grand jury is now needed to find out what really happened." The official story has McVeigh blowing up a truck full of fertilizer in front of the building. Yet live TV footage from local news stations show without doubt that several bombs were planted in the building. Strangely, the official story completely fails to mention this. This perplexing TV footage from the day of the bombing begins at 1:10 in the revealing five-minute video below. How then, could the official story say the only bomb was from McViegh's truck. There are many more puzzling questions to this mystery. For lots more powerful, verifiable information suggesting a major cover-up, click here. More questions are raised than answered. Could McVeigh have been a Manchurian Candidate? This is the only scenario that makes sense from the research I have done on this vital topic. For government documents supporting this important possibility, click here. The box below provides several ideas on what you can do to educate yourself and help get to the bottom of the Oklahoma City bombing. We also invite you to comment below and let us know what you think. Why is the government withholding evidence from the public in the bombing, and how can we get a real, unbiased investigation? Click on the links mentioned in the above article to learn more about the many inconsistencies in evidence regarding the Oklahoma City bombing. Inform your media and political representatives of this important information. To contact those close to you, click here. Urge them to explore this evidence and open a new investigation into the bombing and why the evidence is not being released to the public. Learn about how the secretive power elite of our world may be involved with events like the Oklahoma City bombing in this powerful lesson from the free Insight Course.